After a disappointing meal at Chef Drew Nocente’s 5th Quarter which met an early demise, I was apprehensive about eating at Salted & Hung along Purvis Street by the same chef, especially when both restaurants’ concepts are similar. 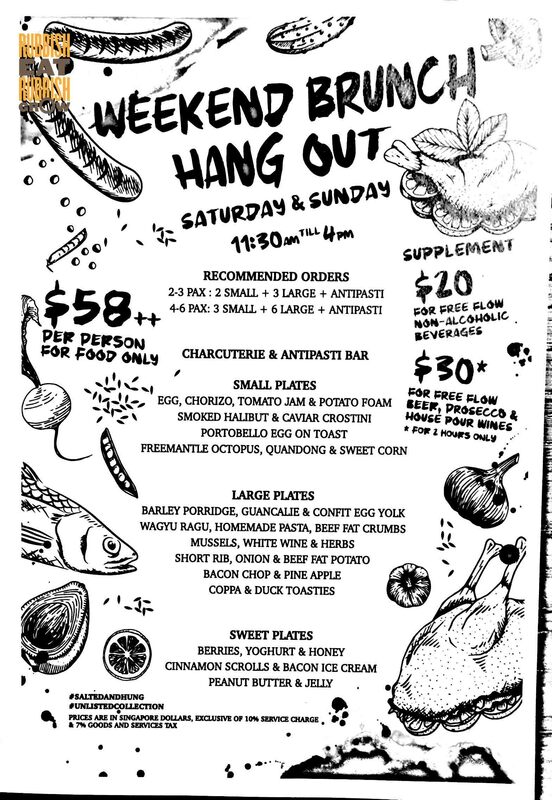 Salted and Hung is a contemporary Australian restaurant with a menu that has a strong focus on in-house curing and grilling using head-to-tail of the animals. But my friend highly recommended Salted and Hung’s Weekend Brunch Buffet ($58++); it is, she said, as tasty as it is worth the buck. I trust her good taste and yes, it turned out that we had a fabulous meal. A little background: Chef Drew Nocente has a stellar resume: sous chef at Gordon Ramsey’s Maze Grill (London), Sous chef Table No. 1 by Jason Atherton, and Skirt at Hotel W.
A supplement of +$20 for The Weekend Brunch gives a free-flow of non-alcoholic beverages and a supplement of +$30, a free-flow of beer, prosecco and house pour wines limited to 2 hours. There is a buffet table serving charcuterie. That day, there was three types: venison loin, coppa (Italian cold cut from the neck of the pig), and duck prosciutto. The last one is the best; the fats give much flavour that Mr Fitness went for round after round. The rest of the buffet comes as individual plates. There are only 13 plates so a group of 4 people can cover the entire menu. Even with just Mr Fitness and I, we already had 9 plates. The best dish has to be the smoked halibut and caviar crostini (above). It is extremely bold. The bread is toasted so darkly it gives a bitter counterpoint to the extremely salty and smoky halibut. The creamy sauce does not make the bread soggy, so there is a wonderful juxtaposition of crunchiness and softness. The Freemantle octopus is also fantastic in its texture: charred and tender. It comes with sweet corn and quandong sauce. (Quandong is known as a native peach in Australia.) There are also two sheets of lardo (basically pork fat) and they give much umami to the octopus without robbing away the subtle taste of the seafood. Our friends highly recommended this homemade pasta with wagyu ragu and beef fat crumbs. It’s normal and a bit bland for us. So when the short rib came and it was as under-seasoned as the pasta, we requested for some salt. The salt transformed it. The texture was fork-tender, but the additional salt really brought out the flavours of the beef. If we hadn’t add the salt, the beef fat potato so incredibly crispy might have upstaged the main. They ran out of mussels that day, so they substituted them with clams in white wine. They are topped with salty fingers, which I don’t like. The texture is like a waxy spring onion and its saltiness leaves a bitter aftertaste. I’d rather it be just spring onion. The bacon chop isn’t those melt-in-the-mouth but it has a good, chewy texture which we prefer. It’s a tad too salty for me, but the sweet, roasted pineapple serves to undercut it. The barley porridge swims in a cheesy emulsion whose heaviness is offset by the crispy guanciale (cured pork cheek) which is really just glorified bacon. The only dish that we didn’t like is the cinnamon scrolls (too hard) with bacon ice cream. But the yoghurt is great. The berry meringue wraps around a frozen berry yogurt, very sour, very refreshing. I can eat this everyday for breakfast. We spent $136 for two persons. On the whole, Salted & Hung is fantastic. The food is pleasing and well conceptualised. The service swift and knowledgeable. But we must protest against the music choice. It was playing rock and heavy metal on a Sunday afternoon. I understand the music is great for an after-work convivial dinner crowd, but for weekend brunches? People are having hangovers during weekend brunches! They should play jazz. We didn’t want to be passive aggressive so we asked the waiter to change the music but he said they didn’t control it. I wondered who did.